The so called second founder of the Dominican Order. Born at Capua, Italy, in 1330, Raymond delle Vigne entered the Dominicans while attending the University of Bologna and subsequently held several posts, including prior of the Dominican house in Rome and lector in Florence and Siena. 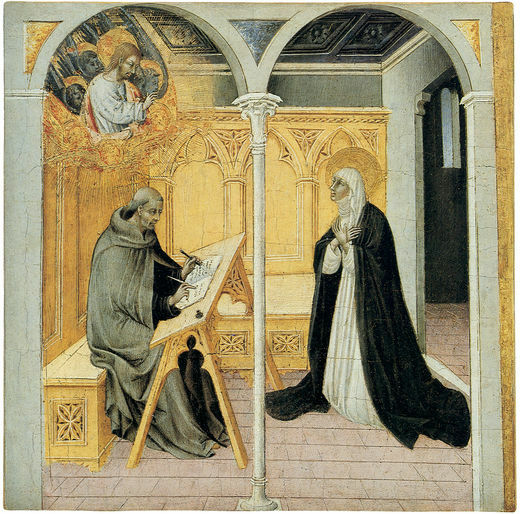 While at Siena, he made the acquaintance of St. Catherine of Siena, serving as her spiritual director from 1376 and becoming her closest advisor. Through the years he was connected with most of Catherine’s important undertakings, including the call for a Crusade against the Turks, the negotiation of peace between the papacy and Florence, and the plea made to Pope Gregory XI to depart Avignon and return to Rome. Raymond also worked to bring aid and comfort to the victims of a plague which struck Siena, and when he fell sick with the disease, Catherine nursed him back to health. Upon the start of the Great Western Schism in 1378, both Raymond and Catherine gave their support to Pope Urban VI against antipope Clement Vll. Raymond traveled to France in an unsuccessful bid to win the support of that kingdom; during the sojourn he was nearly killed by overzealous partisans of Clement VII. He continued to strive for a peaceful settlement of the crisis in the Church, even after Catherine’s death in 1380, and was elected master general of the Dominicans As head of the order until his death at Nuremberg, he brought reforms to its houses and demanded the strict adherence to the rules laid down by St. Dominic. He also wrote biographies of Catherine of Siena and St. Agnes of Montepulciano.